In Atlanta, most Korean barbecue restaurants seem to be moving toward electric grills, leaving charcoal-based ’cue—with its superior smoky flavor—increasingly hard to find. And the few charcoal-based restaurants that remain require certain concessions with marinade, meat quality, or banchan (complimentary dishes that accompany your meal). 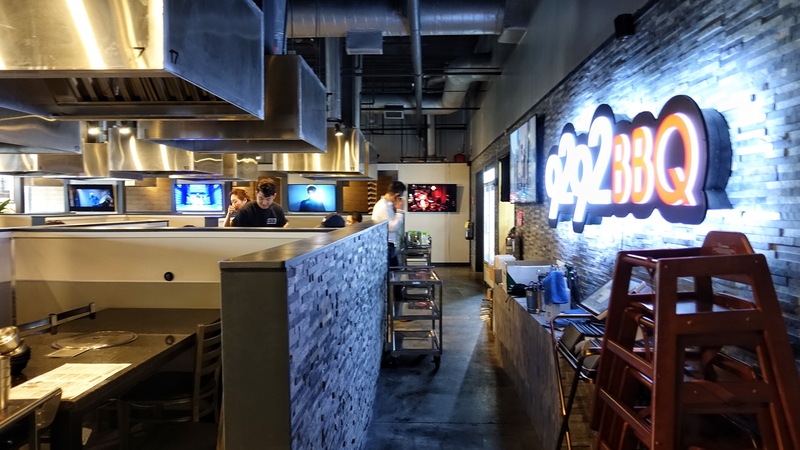 But at Duluth newcomer 9292 Korean BBQ, there are no compromises, only a bounty of options and exceptional quality. Just a sampling of the televisions that line the wall at 9292. The special combo: pork belly, seasoned pork short ribs, rib eye, beef bulgogi, and beef brisket. The kitchen is run by three chefs hired from Korea, and the high quality is the name of the game, from the meat to the banchan options (which change daily) to the local Royal Oak charcoal sourced for the barbecue. All of this translates into higher prices, but it’s worth the extra cash. (If you are looking to save, visit at lunch, where there are a wide variety of lunch specials starting at $8.99.) 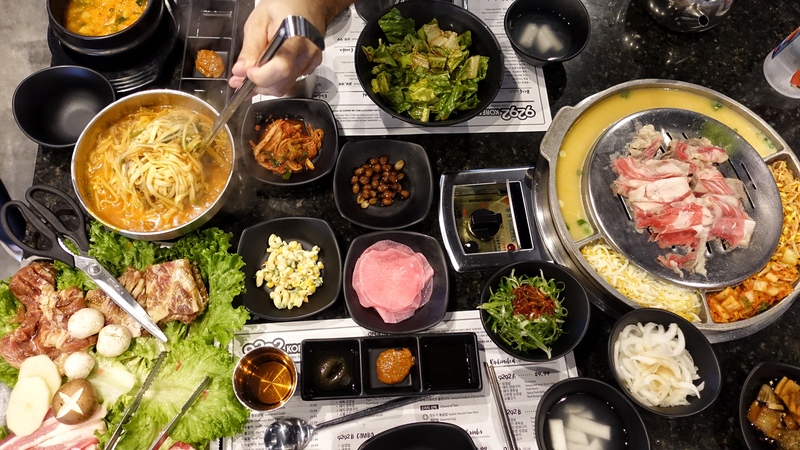 The menu is extensive with pork kimchi stew served in a hotpot, noodle soups such as yukgaejang kalguksu (beef noodle soup in a cast iron pot), made with hand-cut noodles, alongside more traditional dishes. 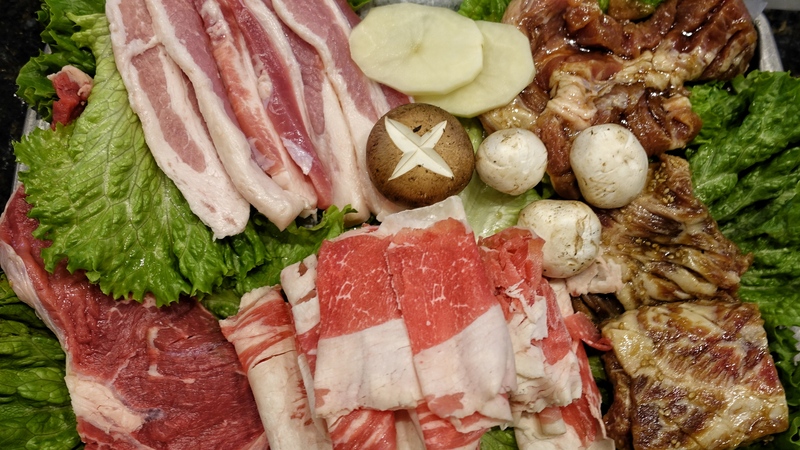 There are numerous ways to attack the barbecue: You can order pork, beef, or seafood individually, pig out on all-you-can-eat options ($29.99 and up), or order complete meals for two for that include banchan, bean paste soup, and kimchi radish fried rice ($59.99 and up). There are also a few seriously splurge-worthy meals ($89.99 to $129.99) featuring a feast of meats such as beef brisket, rib eye, marinated beef short rib, “hand rub” seasoned steak, prime rib, and shrimp with butter and salt. And when your food arrives, you’ll feel like a five-year-old on Christmas morning. Seriously. The table quickly fills with tiny dishes of banchan (when we dined, it was kimchi cabbage; sweet, soy-glazed peanuts; and a chilled corn and pasta salad, dressed in mayo), a bowl of salad dressed in a sauce that tasted like thousand island laced with Korean red pepper, and a choice of rice (go for black bean, which is more purple than black). We ordered the special combo (above, $69.99 for two), which came with pork belly, seasoned pork short ribs, kalbi (beef short ribs), rib eye, beef bulgogi, beef brisket, and all the standard extras. The marinated kalbi and seasoned pork ribs were incredibly tender. Our server told us the marinade used is a secret recipe only a handful know, but it certainly tasted far more complex than the usual sweet and salty soy flavors. The meats are served with three dipping sauces: salt and pepper slurry, bean paste, and a soy-based option. Surrounding the grill grates, which change when you move from beef to pork, is a sectioned-off ring (pictured above on the right) filled with cut corn and mozzarella, beaten eggs poured from teapot into the ravine, and red pepper-laced bean sprouts and kimchi cabbage. The veggies warm, the eggs bubble up into an almost souffle-like texture, the cheese melts around the corn, all while you enjoy your meal. The final course at 9292: Kimchi fried rice. When all of the meat has been devoured, a server arrives with a cast-iron plate of kimchi fried rice, made with radish kimchi instead of the standard cabbage. 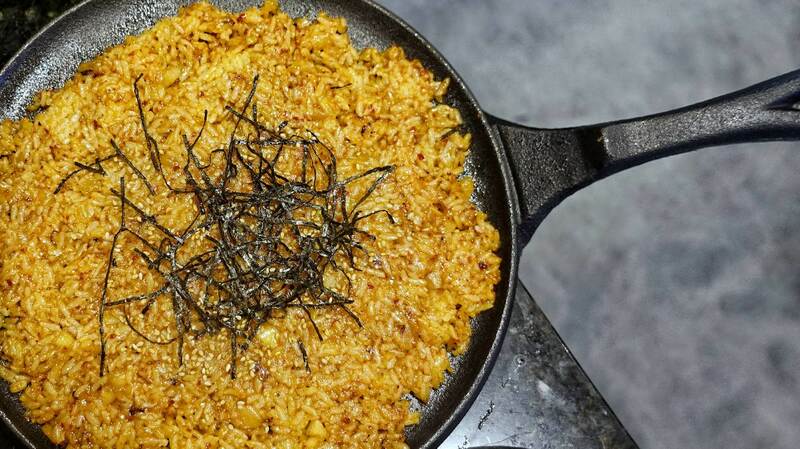 The pan is placed directly on the fire at the table, perfectly crisping the edges of the rice. If you like, the server also will bring a dish of mozzarella to melt on top, but that was too decadent for me by the end of the meal. In fact, 9292 gives you so much food that I tapped out after two reluctant, but tasty bites of kimchi fried rice.